This Friday 27 March, 1-2pm at the White House. 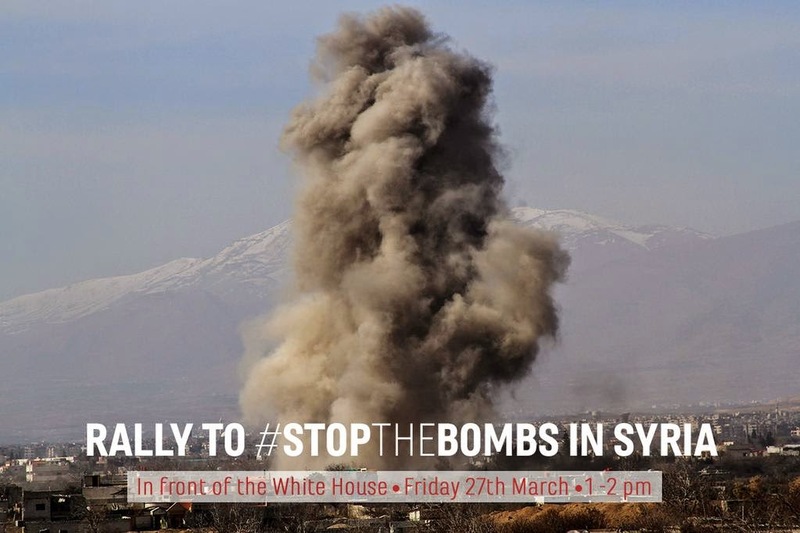 Join us as we stage a protest to demand the United States take action to stop the Syrian regime dropping barrel bombs and chemical weapons on civilians. 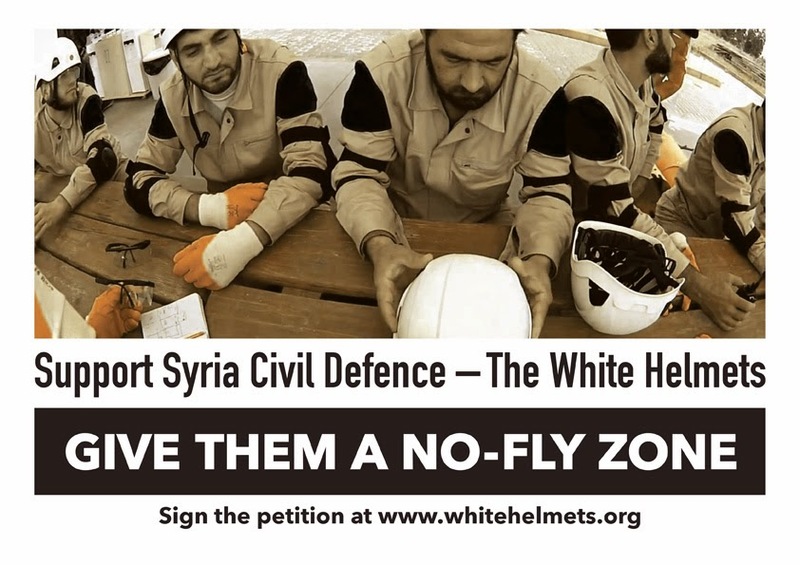 Come and add your voice to the voices of Syrian volunteer rescue workers - the White Helmets, thousands of non-violent activists in Syria and nearly 600,000 people around the world who are calling for a no fly zone. On the 16th March the Syrian regime dropped barrels of chlorine on civilians in Sarmeen, Idlib killing six and injuring dozens. The attack came just 11 days after the UN Security Council voted on a resolution saying it would take further measures, including the possibility of military force, if chlorine gas was used again in Syria. Now it has been used. The Syrian regime is testing us – if the international community doesn't take action, if our leaders break their word, it will be a green light for thousands more to be killed using poison gas and barrel bombs. The attack also comes 390 days after the UN Security Council passed a resolution banning the use of barrel bombs. Despite these threats, the Syrian regime is doing nothing to ease its attacks on civilians. Barrel bombs have killed nearly 2000 children. Every barrel bomb Assad drops also strengthens ISIS. Any support these extremists have in Syria is directly linked to the mass human rights violations of the Assad regime. If we want to defeat ISIS we have to end the violence in Syria. Stand with the Syrian people because no one is free until we’re all free. 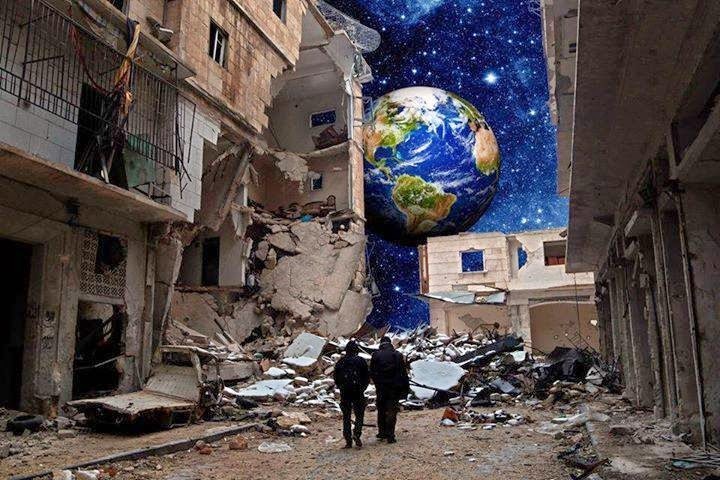 A call from Planet Syria: Is anybody out there? Non-violent activists across Syria are calling for global solidarity around their joint demands of stopping the regime's barrel bombs and pushing for inclusive peace talks. Extremism breeds from injustice – the biggest killer of civilians in Syria today is the ‘barrel bomb’. These are often old oil barrels filled with explosive and scrap metal and rolled out of government helicopters and planes miles up in the air onto hospitals, schools and homes. The UN Security Council unanimously banned them a year ago. Nothing has changed since then – nearly 2,000 children have been killed since UN Resolution 2139 was signed on February 22, 2014. The international community must follow through on its demands and stop the regime’s barrel bombs and air attacks – even if that means with a ‘no fly zone’. You’ll also find Planet Syria on Facebook and Twitter. 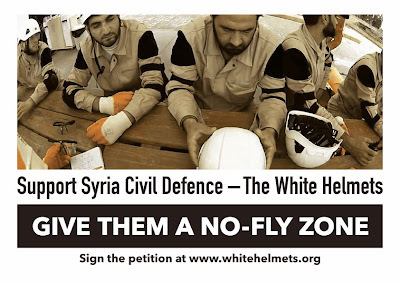 The petition being run by Syria Civil Defence and The Syria Campaign calling for a No-Fly Zone has now been joined by another organised by Avaaz. 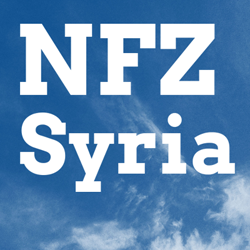 The Avaaz petition calls for “an air exclusion zone in Northern Syria, including Aleppo” rather than an all-Syria no-fly zone, but it’s still most welcome, and Syria Civil Defence are encouraging followers to sign. 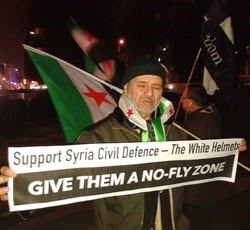 I have signed the Avaaz petition, though it’s not just northern Syria that needs a no-fly zone. For example Douma in the south near Damascus has been suffering greatly from Assad’s air attacks. At least 26 people were killed there on Sunday alone. Here’s a video of rescuers on the scene. What’s needed is to ground Assad’s air force nationwide through deterrence and—if necessary—retaliation. This means demanding air attacks cease immediately, and if there is a single air attack after that demand then retaliating against Assad’s air bases with standoff weapons. A ‘deter and retaliate’ strategy is no harder to apply nationwide than it is in just a part of the country as it doesn’t require air patrols to enforce. The major parties in the UK are now largely silent on Syria, adopting a ‘don’t mention the war’ approach in the run up to the election. We need to do all we can to break that silence. 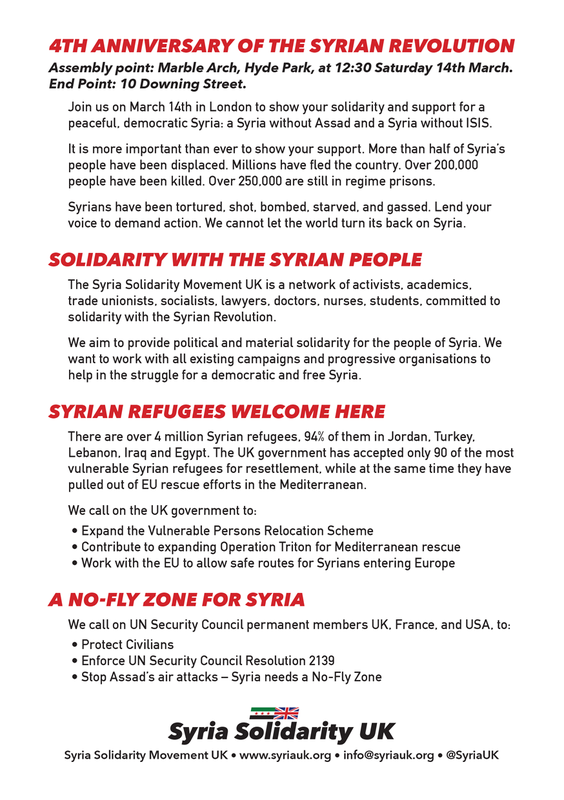 Finally, if you’re in London tomorrow, please join Syria Solidarity UK and others calling for a no-fly zone at the American Embassy from 2 to 4pm. 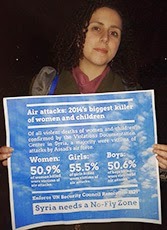 Above images via Syria Solidarity UK: 17th March London protest outside the US Embassy following new Assad regime air attacks with chlorine bombs. There will be a further protest outside the US Embassy this Sunday, 2-4pm. Facebook event page here. 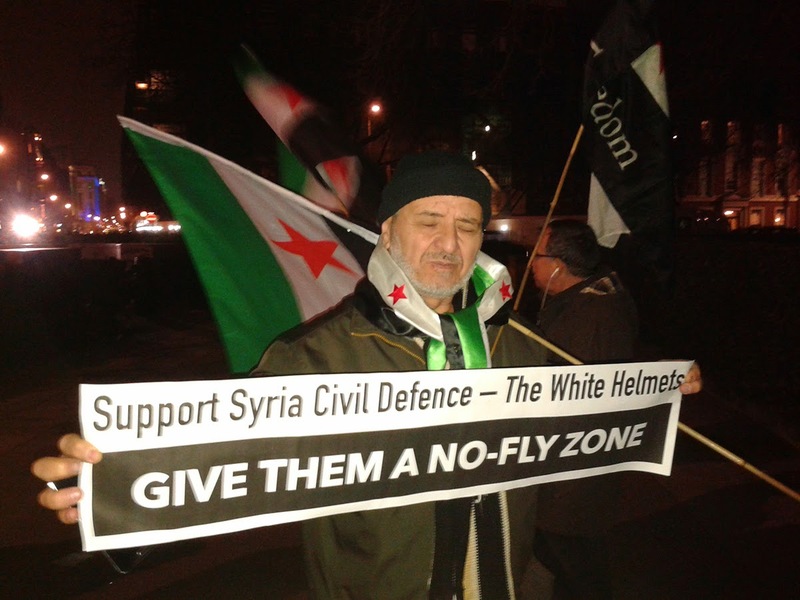 Note that last Saturday’s march to Downing Street also called for a No-Fly Zone. Barrel bombs themselves were banned last year in a separate UN Security Council resolution 2193 on 22 February 2014. However, since then according to the Syrian Network for Human Rights at least 1,892 children have been killed by them. Last year, two out of every five civilians killed in Syria were killed by Assad’s air attacks. 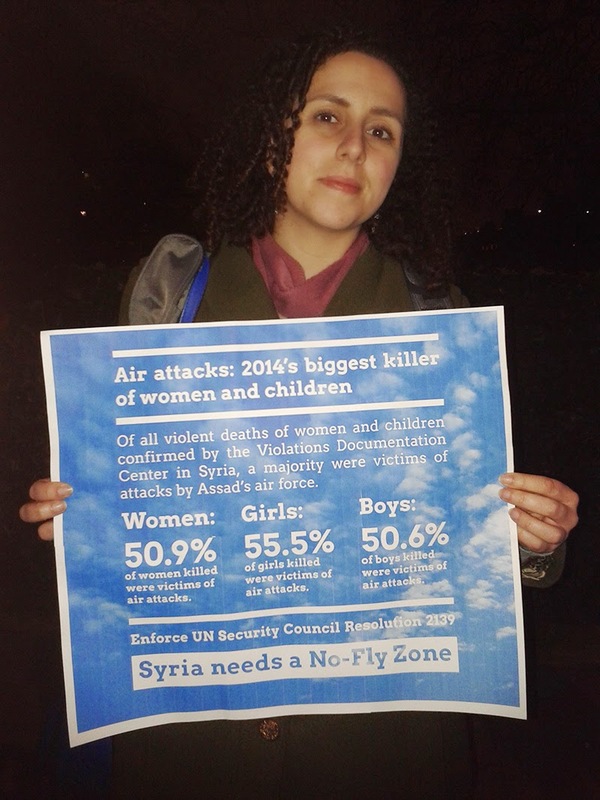 Over half the women killed last year were killed by Assad’s air attacks. Over half the children killed last year were killed by Assad’s air attacks. There is no other single measure that could do as much to save civilian lives as stopping Assad’s air force. 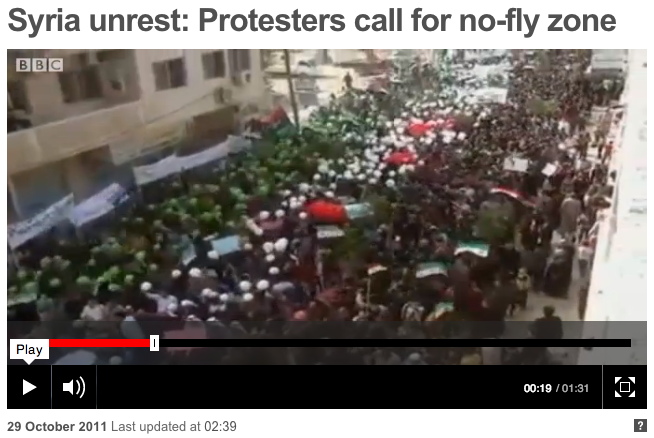 Some say this should be done by giving the Free Syrian Army anti-aircraft weapons. That might help, but not enough. Not enough to stop Assad’s bombers. There are too many. They attack over too wide an area. They fly too high. So the best way, the one way, the only way to ground Assad’s air force, is for the UK, France, the USA, one or all of them I don’t care, to make the decision. Tell Assad this stops now. Tell him, your bombing stops now or we start hitting your air bases. UK, France, USA, ground Assad’s air force. Four years is too long. Join us today in London. In a situation like Syria, I have to ask, can we make a difference in that situation? Would a military intervention have an impact? How would it affect our ability to support troops who are still in Afghanistan? What would be the aftermath of our involvement on the ground? Could it trigger even worse violence or the use of chemical weapons? What offers the best prospect of a stable post-Assad regime? And how do I weigh tens of thousands who've been killed in Syria versus the tens of thousands who are currently being killed in the Congo? As Michael E. O’Hanlon pointed out at the time, Congo presented a very different case to Syria. Most of the deaths were being caused by malnutrition and poor healthcare, not directly by violence. A UN peacekeeping mission was in place, and had been since 1999. The US had been involved in training the DRC’s military since 2009, though with mixed results. Michael E. O’Hanlon argued that there was certainly more that the US could usefully contribute, but that the DRC conflict was much less violent than those the US had faced in Afghanistan and Iraq, and also that conditions in Syria and the DRC were quite different, so that even if the US decided to commit forces in both places, the kinds of forces each would require would not be the same, and so there would be few if any conflicting demands from the two missions. So different are the problems in Syria and the Democratic Republic of Congo that it’s hard to believe the President was raising the DRC in his Syria answer as a genuine concern; it seems to have been more of an attempt to use Congo’s problems as a rhetorical diversion. This is what is known as ‘whataboutery’. 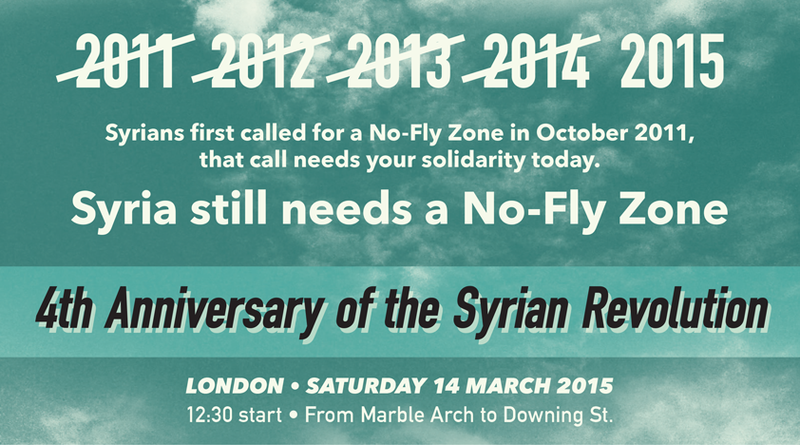 Syrians first called for a No-Fly Zone in October 2011—that call needs your solidarity today. 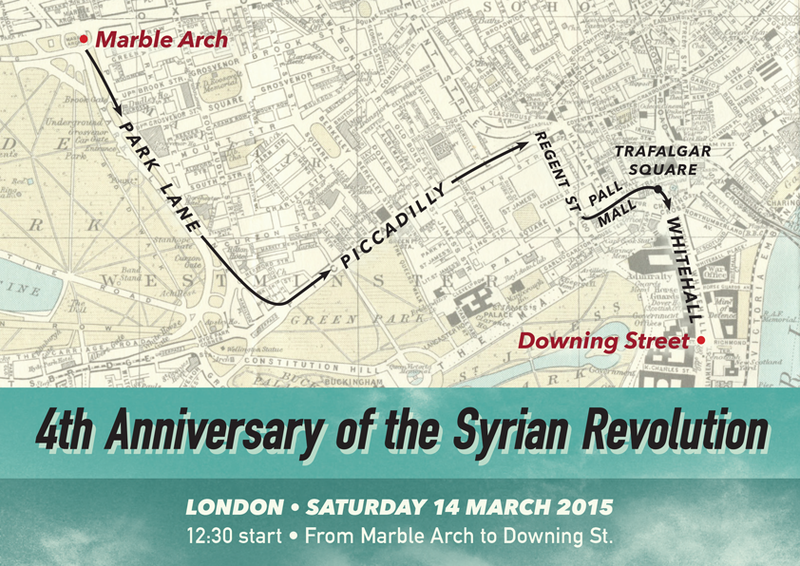 Join the 4th Anniversary march for Syria in London on Saturday 14th March and call for a No-Fly Zone for Syria. Assembly point: Marble Arch, Hyde Park, at 12:30.